Around 280,000 migrants entered the German asylum system in 2016, and less than 1,000 did not come via safe third countries. If Germany’s Basic Law and the European Union’s (EU) Dublin Agreement were fully implemented, then 99.6 per cent of the migrants entering asylum claims would not be allowed to do so. “In 2016, a total of 903 asylum seekers who were not sent to Germany via a safe third country or a safe country of origin were identified by the federal police at German airports,” Germany’s Federal Police Agency told WELT AM SONNTAG. Safe third countries invariably surround Germany, and if Angela Merkel’s government had upheld the law, all of the 280,000 migrants applying for asylum last year should have been classed as already safe. The EU’s Dublin Agreement stipulates that migrants must apply for asylum in the first safe European nation they enter. Germany is legally required to at least inquire with the EU nation that a migrant first entered when they apply for asylum, and process their request if they cannot be returned. However, Chancellor Angela Merkel unexpectedly suspended the rules, with little consultation, in August 2015 at the height of the migrant crisis, and said “no upper limit” of migrants could apply for asylum in Germany. The number of migrants began rising shapely soon after and more than a million arrived in 2015. In November 2015, Germany’s Secretary of State for the Federal Ministry of the Interior, Ole Schröder, admitted that the chaos had meant they had no idea how many migrants had entered the asylum system. 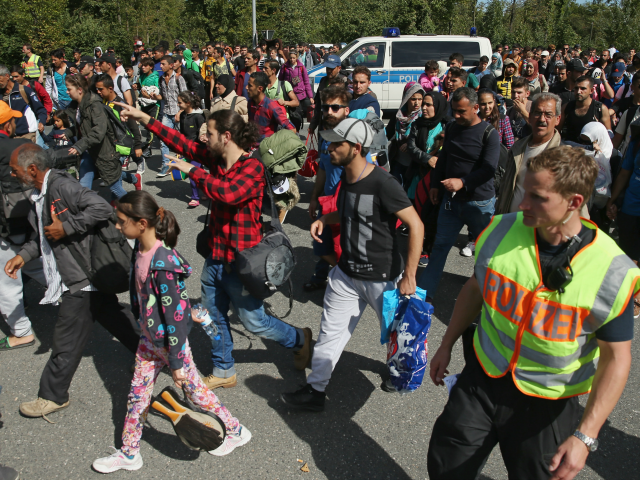 Many migrants register in multiple nations as they “shop around” for the best asylum and welfare conditions – something the Dublin Agreement was designed to stop – and in February 2016 Germany admitted it had “lost” 130,000 asylum seekers.